Brighten any room or event's ambiance with an elegant sparkle that is always in style. With shiny, sparkly, silver mirror mosaic accented decorative columns, you can add a dash of imperial sheen into your flower arrangements, bouquets, and plant decorations. 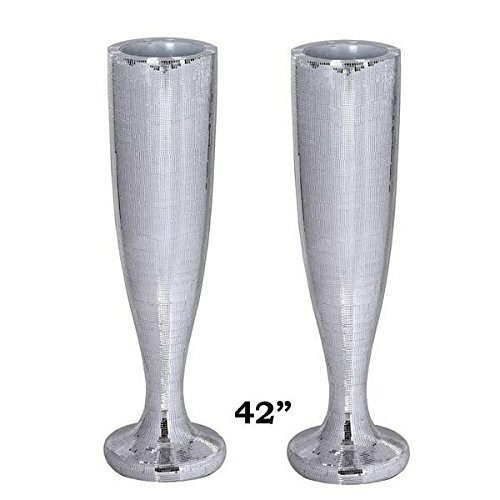 With stylish, glitzy, and glamorous design, these silver mosaic vases are a perfect addition to any modern home, posh party, or an elite gathering. Slender, artistic shape coupled with brilliantly mosaic mirror accented design grant these tall columns an attention grabbing charisma. Throw some light on these reflecting mirror adorned columns to create a majestic spectacle of glitz and glam. Either place these on their own to exude surreal shimmer and glimmer, or top with pots of fresh or artificial flowers, kissing balls, plants, or candles to create a charming medley of colors, sparkle, and festive glee. Additional Information Quantity: 2pcs; Size-42" height Extra bonus One Glass Mirror Strip - 1 ft length with 177 glass mirrors (approx) will be sent in case of missing/damage, can be replaced easily, free of charge. Due to delicacy of the item, pieces may fall off during transit. We will add additional mirrors with the item and can be glue back easily. If you have any questions about this product by Tableclothsfactory, contact us by completing and submitting the form below. If you are looking for a specif part number, please include it with your message.